In an earlier blog post we explained how distributed ledger technology (DLT) can provide transparency and accountability. 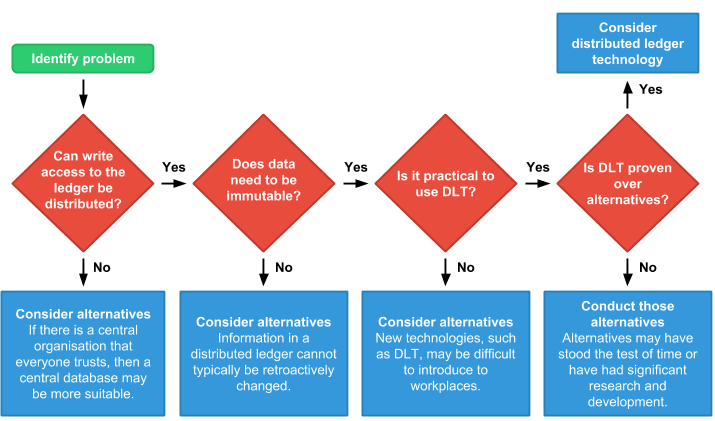 In this post we’re going to take a closer look at how to decide whether DLT might be a good fit for a policy problem. The governance of distributed ledgers is normally decentralised. For example, every transaction made with the cryptocurrency Bitcoin can be seen in a publicly distributed ledger. Anybody can access this ledger, add a transaction to it, and check if a transaction is legitimate. limit access to the ledger to trusted parties. These aspects of central governance can be applied to DLT as long as the central party is trusted. For example, if academic qualifications were to be stored on a distributed ledger, then a trusted party such as a government department could ensure that only accredited institutions are allowed to add to the ledger. However, if the central party were the only party permitted to add to the ledger, then it may be worth considering the use of a central database instead. Data held in a DLT cannot be retroactively changed. Information held in distributed ledgers are distributed amongst many people, making it difficult to remove or change existing information. DLT may not mesh with existing processes. For example, a possible use of DLT is to verifying digital evidence collected by the police. However, this must fit with processes and standards for collecting and storing digital data. DLT is a new technology which may not yet be sufficiently proven for some use cases. Alternative technologies may have stood the test of time or have had significant research and development. DLT definitely has potential to transform public services. However, it is important that decisions to use DLT are carefully considered.